The Rev. 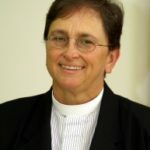 Elder Nancy Wilson served as moderator of the Universal Fellowship of the Metropolitan Community Churches (MCC) from 2005 - 2016, following the retirement of the Rev. Elder Troy Perry, founder of the MCC. She lives in Sarasota, Florida.